Blurb: Learn how to make professionally designed window valances with easy-to-follow step-by-step instructions. 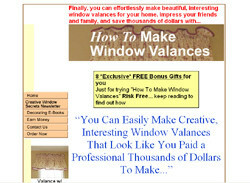 How To Make Window Valances is a simple, step-by-step, well-illustrated guide. It will give you ideas to beautifully design and professionally create window treatments for your home. It is a new information packed, easy-to-understand, easy-to-follow, well-illustrated, step-by-step guide. It is your valuable resource that shows you exactly how to turn those ideas into actual window treatments. -Simple step-by-step instructions to make 17 window valances.